was born at Newton Abbott in Devon on the 24th of February 1909 the twin son of Major Lancelot Alfred Luxmoore, Royal Artillery and Charlotte Evelyn Constance Luxmoore of "The Roundel", Rye in Sussex. He was educated at Lancing College where he was in Heads House from September 1922 to July 1928. He was a member of the Cricket XI in 1927 and 1928 being Secretary in the latter year. He was a member of the Boxing team in 1925 and 1926 and the Athletics Team in 1927 and 1928. He gained his School Certificate in 1927 and was a Cadet Officer in the Officer Training Corps achieving Certificate A. He went on to Hertford College, Oxford in 1928. 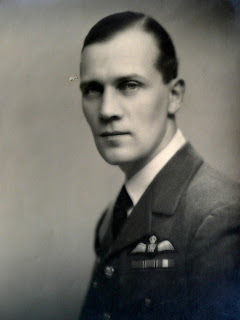 He was commissioned as a Pilot Officer in the Royal Air Force on a short service commission on the 15th of August 1929 and was posted to the Royal Air Force Depot at Uxbridge. He was promoted to Flying Officer on the 14th of April 1931. On the 16th of June 1933 he was posted to No. 3 Armament Camp at Sutton Bridge and on the 30th of October 1933 he was posted to the Air Armaments School at Eastchurch. On the 15th of December 1933 he was posted to the Anti Aircraft Co-Operation Flight at Biggin Hill. On the 17th of December 1934 he was posted to 43 Squadron at Tangmere and on the 23rd of April 1935 he was posted to 25 Squadron at Hawkinge. He was married to Annette Rosemary (nee Pugh) at the Church of St James theLess at Litchfield in 1935. They had a son, Fairfax, born on the 18th of July 1940. After his death she remarried Patrick Vincent Lawford in 1944. Shortly after he was married he was posted to Egypt. He was promoted to Probationary Flight Lieutenant on the 15th of March 1935, a rank which was confirmed on the 1st of June 1936 when he was granted a permanent commission. On the 24th of February 1937 he was posted to the Electrical and Wireless School at RAF Cranwell. He was promoted to Squadron Leader on the 1st of August 1938 and was Commanding Officer of 144 Squadron at the time of his death. W/C A.N. Luxmoore’s last air-raid mission May 11-12, 1940. On the 11th of May 1940 37 aircraft from Bomber Command, being 19 Hampden and 18 Whitley bombers, were dispatched for an operation on Mönchengladbach to bomb road and rail links in the area in an attempt to impede the advance of the German forces which, on May 10,1940 had attacked and invaded the Low Countries. This was the first bombing raid on a German town of the war. Arthur Luxmoore and his crew took off from RAF Hemswell at about 10.30pm on the 11th of May 1940 in Hampden MkB1, P1326 PL-? for the operation. May 12, at about 00.30 () they were at 6,000 feet and approaching the target area when they were hit by flak (German anti-air guns) several times which caused severe damage to the starboard engine and to the rudder controls. He managed to steer the stricken bomber in a south-westerly direction, slowly losing height. An hour after being hit he ordered his crew to bail out and all three landed safely on friendly territory in Belgium, somewhere in the neighborhood of Hulsonniaux, commune of Houyet, Namur province. Making his way to the nearest village, P/O Allitt was at once challenged by a French soldier who held him up with his bayonet under the impression that he was a German parachutist and put him under arrest in the guard room. He explained that he was an English ﬂying ofﬁcer, but they were taking no chances until a French officer arrived and escorted him to his HQ at Vaucelles (Belgium). Sergeant Wathey landed in a big tree down which he climbed with difficulty in the dark. Making his way laboriously, with many a stumble, through the undergrowth of the wood, he suddenly felt himself slipping and rolling downwards. When at last he came to a stop he found he was on the edge of water, so he wisely remained where he was until daylight. In the dawn he saw he was on the bank of a river (the Meuse), so he set off again to the west, falling in with two Belgian peasants whom he accompanied along the road. From time to time German aircraft ﬂew over the road and machine-gunned them, but each time they managed to escape. After tramping for eight miles Sergeant Wathey was challenged by some French soldiers who promptly arrested him, having no doubt that he also was a German parachutist. Marching him to headquarters, they handed over their prisoner. W/C Luxmoore remained at the controls of his aircraft so that a crash in the village of Finnevaux, 11 kilometers south, south of Dinant in Belgium, could be avoided. His grave in Finnevaux is maintained by a grateful commune, under the supervision of the Commonwealth War Graves Commission and the commune has honored his name on the War Memorial in the center of Finnevaux. I understand that there is now a regular procedure for making enquiries at the American Embassy in Berlin regarding prisoners of war in Germany and enemy occupied countries. I should be much obliged if you would make an enquiry of this sort concerning acting Wing. Comm. ARTHUR NOBLE LUXMOORE B.A.F. No, 86112, who was reported missing on May 12th. The facts so far as I have been able to ascertain them are that he was returning from bombing operations somewhere in enemy territory in a Hampden Bomber No. P.1326; one engine of the bomber was out of action and after losing height three of the crew landed unhurt by parachute and were near enough to friendly country to get back, one walking about eight miles before meeting French troops with the numerals 62 or 9 who took him to the H.Q. of the 9th French army. This took place at approximately 1.20 a.m. in the neighborhood of a village called HOUYET, east of DINANT, ARDENNES. Wing. Comm. A.N. Luxmoore remained in the plane and it is believed that he would have made a similar landing himself. The enemy were advancing at the time and I wish to ascertain whether he was taken prisoner and is still alive and whether the American Embassy can obtain any information about him from the enemy. In the case of any information becoming available would you please communicate with me at the above address. I have tabulated the facts on a separate sheet for your convenience.